Yesterday began the fifth annual test-half-a-million-recipes-in-the-run-up-to-the-holiday-Menu-Mailers marathon that we have every year in the Foster household. Truth be told, we don’t do Thanksgiving at Thanksgiving. We don’t do Christmas at Christmas. Why? Because by the time the holiday rolls around, I’ve tested so many turkey, dressing and side dish recipes that if I have to cook them one more time, I’ll puke. The kids are plotting full-scale revolt and beg me to fix anything but. My husband grits out a smile every time yet another slab of turkey lands on the dinner table in front of him. I appreciate my mom. When Turkey day finally rolls around, she buys a big ham and fusses over what side dishes she wants to fix. My contribution is to buy some paper plates, slap some green beans and sweet potatoes on the table and call it a meal. I’m done. Yesterday, we began with the turkey breast (I can’t get whole turkeys locally yet) and sweet potato side dish. I was determined to ignore that I was sleep-deprived. I was just fine. I was up to the task. I can cook turkeys in my sleep by now! 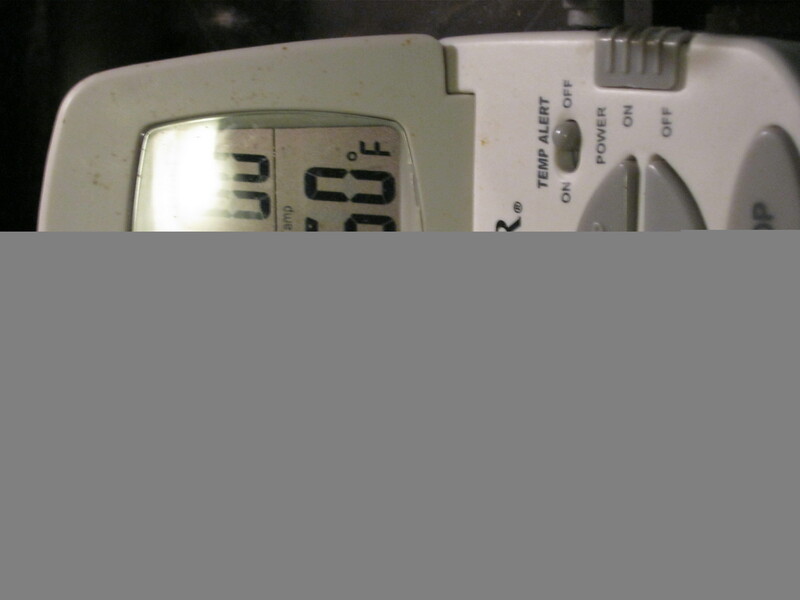 I glanced up from my desk after an hour and a half to realize that I had set the temperature wrong. 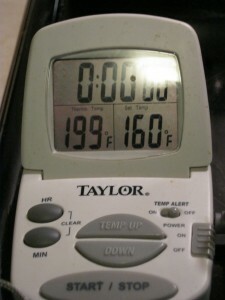 I had it 100 degrees too high, I didn’t turn it down after thirty minutes like I was supposed to. Whoops! I’ll just run right over and turn it back down to 350. 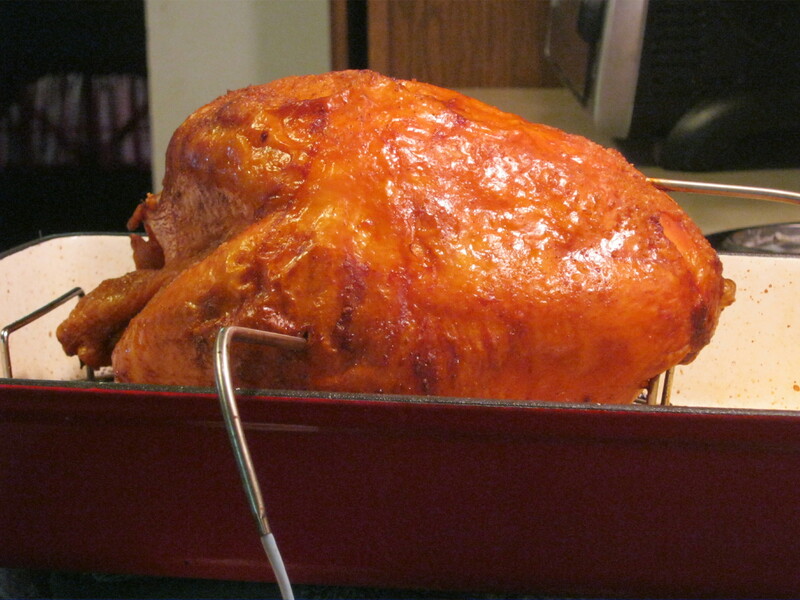 I had a probe thermometer in the bird, so all would be well. Right? 138 degrees? Oh…. that’s interesting. It should be done by now! Let’s pull it out and take a look. I pulled out one georgous turkey. Looks nice, doesn’t it? Beautifully browned. Let’s take a closer look. Hmmm….. What’s that black stuff? Maybe the pan drippings burnt because I had the temp too high at the beginning. The meat should be fine, though. That’s why I always put meat for roasting on a rack, right? The thermometer says it’s under-done in the center, but that’s ok, it’s a flop at this point, anyway. By the time the middle is done, the rest will be over-done. ACK!!! What happened!?!?! The meat didn’t cut, it crumbled into little dried bits under the pressure of the knife. It fell to pieces, and not in a melt-in-your-mouth way, either. It was shoe leather! 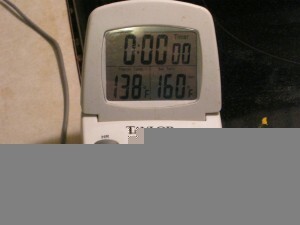 I broke out my second probe thermometer and popped it into the uncut side of the breast. So… what lessons did we learn today? Always check your probe thermometer for accuracy before a major holiday. Never forget to set your timer. Get plenty of sleep the night before you cook a big meal. The cat won’t eat shoe leather, even if it is turkey flavored. Even great cooks have bad days. What’s your fondest kitchen disaster memory? Seriously, I never check thermometers before holidays, but I do believe I will now. So sorry! But you handled the situation in a calm manner and were able to make light of the situation… an honorable character trait that I do NOT have (unfortunately). 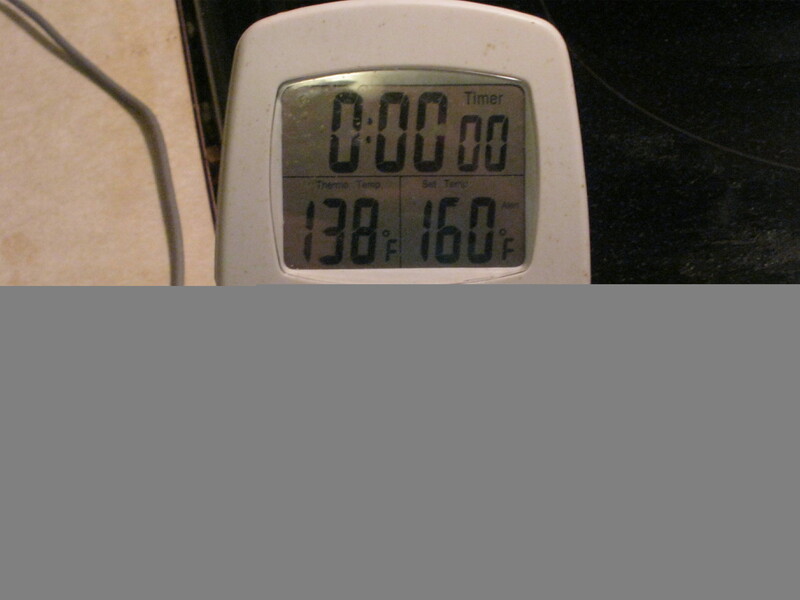 I do not use thermometers – never have – I gauge the turkey by my eyeballs and intuition alone, ha! 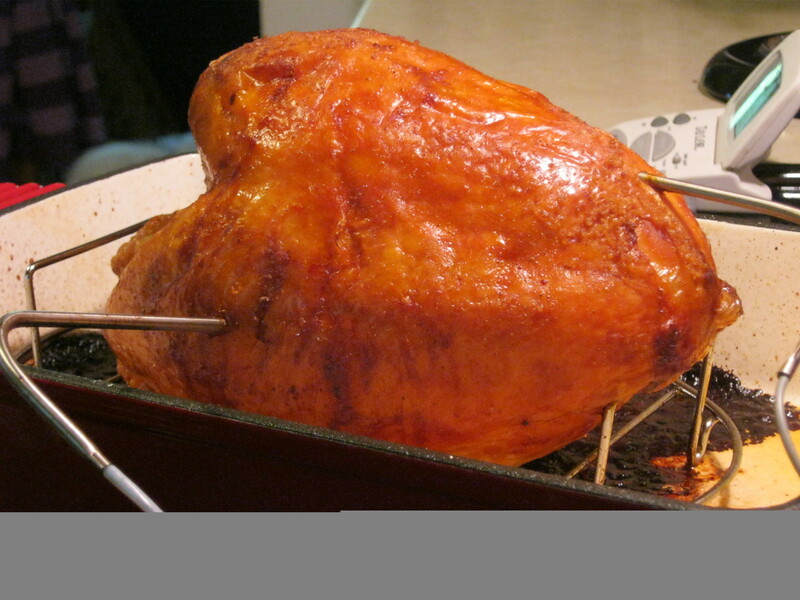 Well, I do time it and test it for doneness and it always comes out great I am SOO not a technical cook – ah well! I have had many many many kitchen flops, my most memorable was the time I accidentally dumped the whole salt container into a pot pie and tried to scoop it all out thinking it would still be good – nuh uh, NASTY! And the time I forgot to wash the spinach for the lasagna I made – the first dish I contributed to my new extended family of my at the time husband. I can remember everyone gritting sand and telling me oh yes the lasagna is great! Yeah right, bunch of liars! My BEST disaster was putting a potato in a microwave to “bake” and hitting 55.55 instead of 5.55 and then leaving the room and forgetting it. When I came back, flames were literally shooting out of the top of the potato, which permanently burnt the top of that microwave. Ironically, I have never had a microwave last more than 3-4 years or so, but this one has been going for 12 years since that fiasco. My FIRST fiasco was when I was 11 years old and cooking dinner for the first time, as up until then my repertoire only included pancakes, french toast, scrambled eggs and box cake mix. I thought the directions on the spaghetti were silly, why WAIT for the water to boil, the pasta would cook quicker if you put it in right away, wouldn’t it? Well, that’s when I learned why you DON’T do that, while being mocked by siblings for the worst dinner ever. IMO, the only people who don’t have kitchen fiascos are those who don’t cook. I am known amongst all my inlaws and extended family as a fabulous cook. I’m equally known with my husband and daughter as someone whose “inventions” are sometimes inedible enough to require emergency pizza delivery. IMO, I could not be the one without the other -I can’t discover the new “keeper” dish without risking the awful one. BTW, the super dried-out turkey can be salvaged. You probably don’t have enough bone to make broth off of a breast, but chicken broth will work fine to turn that dry meat into soup. I’d cut up celery, carrots and onions and stick the veggies raw in quart jars with the turkey, top with broth, can for 90 minutes at 15 lbs pressure, and produce a few score “instant meals” for later to be cooked with made with rice or tiny pasta. 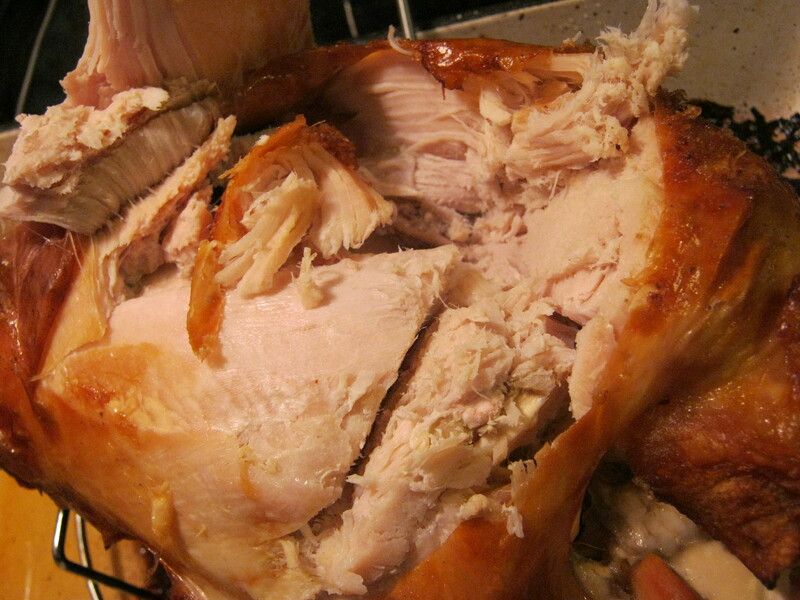 Also, when doing only a breast, which dries so much easier than a whole turkey, put a thin layer of hot broth in the bottom of the pan, below the level of the rack, to keep the oven moist during roasting. It won’t prevent drying out if you massively overcook, but will give you a bit more “wiggle room” in your timing. Also prevents the veggies and drippings from blackening and ruining your “stuff” for sauce. I was going to write something else, about turkey, and then I remembered my worst and first disaster. It was when I returned home from the convent. I had been there for two years and was getting ready to, as we used to say, take the habit. I had been so thrilled. I loved it in the convent. It was very different from my own home, my half-native American alcoholic mother, my all the way crazy Irish cop alcoholic step-father, my poor brother. Our meals consisted of boloney sandwiches, when we were very lucky. But I had the good fortune to go to Catholic schools, and had entered the order of my high school nuns. And had gotten up to the point of taking the habit and making it my real, permanent life. What a wonderful life it was, not the least of which was really good, regular, wholesome meals. Well, as it turned out, my parents had never paid the very small fees from the first year, when they are required (and it’s pretty formal, to protect the Church from being accused of ‘buying’ vocations; the family must take on the small obligation for the first year, something small like ten dollars a month, and it’s strictly enforced.). The mother superior had not brought to to my attention, but now she had to. So I called home, but I knew it was all over when my mother tried to play it off by accusing the nuns of losing her payments (how familiar I was with that argument, from other creditors during my childhood!). She had never paid them and she wasn’t going to pay them now. So I just sighed and told her to come and get me. It was too embarrassing to explain all of it to mother superior, either, when I had spent my whole life trying to conceal my family circumstances from everyone, and I was pretty sure there was nothing she could do to waive this particular Church law. So I went home. I tried to invest home with some of the order of the motherhouse by cooking meals. I got a cookbook at the library, chose a chicken dish at random, tore up the entire kitchen for several hours (not difficult to do in a trailer) executing a series of truly puzzling instructions, and sat them down to a cold gelatinous molded mass consisting of slivers of chicken and julienned vegetables. I had selected a gelee, something no one at that table had ever heard of, let alone eaten. They poked at it, and it wiggled, and they took a couple of tentative bites; drunk though they were, no one threw it at me. It was my first and only attempt to reform my family through regular meals. But not at cooking, and not at imposing sanity on the world by the steady procession of thoughtful meals skillfully prepared. My own family, three hungry little boys and a husband who did not drink, never had a chicken gelee but they had it lots of other ways, and never a disaster since the first one. Maybe cooking is what we do to fight. Uhhh…too many flops to mention. The best is when, as a child, I made a cake w/ a friend after school. The baking powder was expired (I thought I was baking a lot then, but I guess not)….and the cake literally ended up being used by us as a frisbee in our living room. And it hurt when it hit my leg :-). And I think your turkey looks pretty good too..
Adrienne @ Whole New Mom recently posted..Almonds Coated with — Jet Fuel?